This is a high power direct drive motor kit that uses a large capacity rack battery. It is the largest battery we can find that comes in a stylish double layered rack in 48 volts. With 17Ah capacity, you can get a good range and maintain a high speed. The kit is available in either 26″ or 700c rims. We need to lace the motor into a 27.5″ rim for you if you have this different rim size. 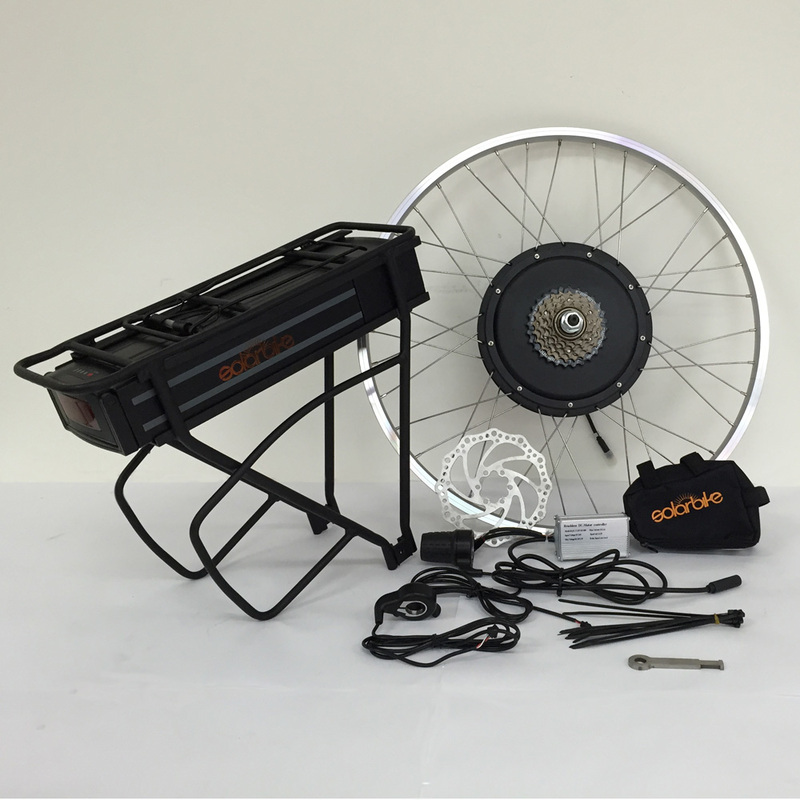 This kit includes a PANASONIC 48V 17Ah rack battery, 48V lithium ion battery charger, motor laced into ALEX DH18 rim with stainless steel spokes, 6 speed cluster, motor, controller, twist grip throttle, thumb grip throttle, torque bar, cable ties, disc, inner tube and instruction manual. All kits are disc compatible. 200W is the legal limit for riding on the road. This kit uses the latest in PANASONIC lithium ion cells, incorporating the highest power to weight cells and high discharge capability. Information: Kit includes PANASONIC 48V 17Ah rack battery, 48V lithium ion battery charger, motor laced into ALEX DH18 rim with stainless steel spokes, 6 speed cluster, motor, controller, twist grip throttle, thumb grip throttle, torque bar, cable ties, disc, inner tube and instruction manual. All kits are disc compatible. 200W is the legal limit for riding on the road.